Since my last update a month ago on the haunted Windhouse stories, I received email from a reader in Stirling, Scotland, whose family lived in the house in Shetland at the turn of the (last) century. Even then the house was known to be haunted, well before it turned into a picturesque ruin on the hill. 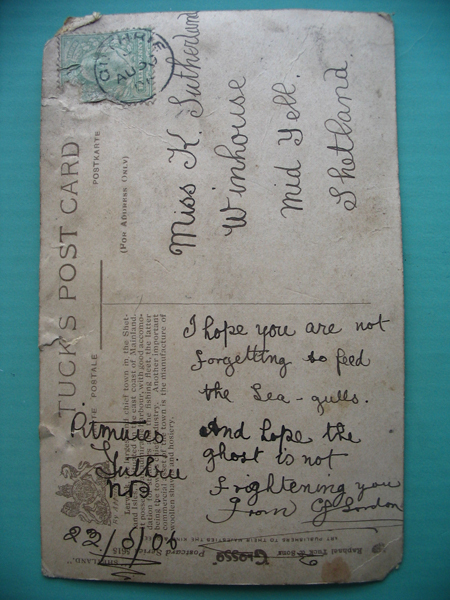 Justine scanned and sent me a copy of a postcard her great-grandmother's sister Katie received referring to the ghost. I updated the essay again, and posted some more photos and links to the family history. They're at the bottom: my Windhouse story.